Forty-one percent of people say they’d unfollow a brand that shared too much irrelevant content. Since content creation or curation is such an ongoing and sometimes time-consuming process, social marketers want to maximize the impact and usage of their assets to engage their brand’s audiences. To do so, teams need efficient publishing workflows to better leverage evergreen content, emphasize brand alignment across teams and organize their brand’s content. We’re excited to announce Sprout’s Asset Library 2.0: a comprehensive way to store relevant and successful content including videos and text snippets, in addition to images, for more streamlined and collaborative publishing and campaign management. 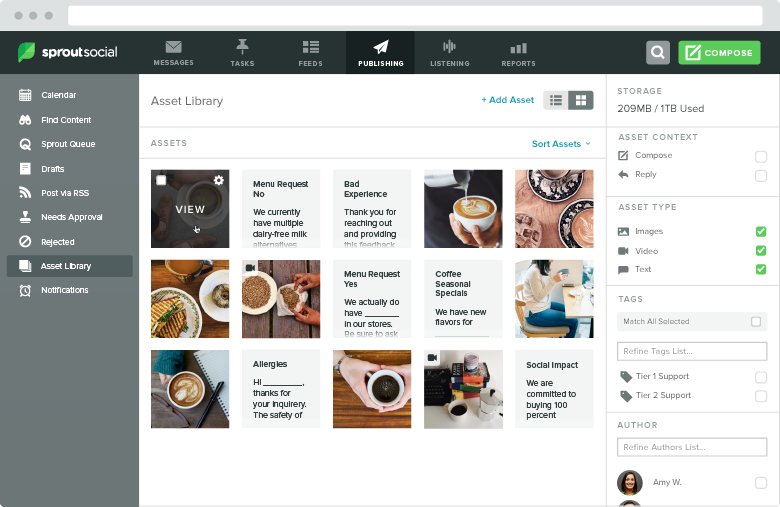 Available to Advanced plans, the updated Asset Library provides social marketers and content creators a centralized location for storing on-brand and approved content. For marketers charged with planning and delivering social content, building out a bank of reusable assets is paramount. By using a single platform to store evergreen content—such as brand-specific hashtags or customer testimonials—you and your team have immediate and easier access to the assets when you need them. With the addition of text snippets and video, and the existing integration with Sprout’s tag management system, the Asset Library can now be used as a multi-faceted content library. Simply upload any of your brand’s long-standing posts, most successful video or visual assets, consistent hashtags or messages. Then, to give more context, include a title or description for more clarity on how your team should use this particular asset. Finally, use tags to group and organize them and make searching for content related to a specific topic, theme or campaign easy and efficient. Whether your team is located in a single office or around the world, the Asset Library provides the permissioning, governance and collaborative workflow to enable your teams to stay focused and aligned with brand-approved content available in a centralized location. After uploading visual content or text snippets, use tags to organize and categorize the assets based on campaigns or to specify which country or region the asset was created for. And now, apply an Asset Context to text snippets specifically to control whether the content can be used for publishing outgoing posts from Compose, for engaging with your customers from the Smart Inbox (via Saved Replies)—or both. When executing social content and campaigns, consistency in brand voice and visual formatting is crucial. Instead of manually recreating the post structure and branded hashtags for each new blog post or announcement, you can create an accessible library of templates for repeated content. Within the Asset Library, save frequently-used posts as templates with the applicable hashtags and links. Additionally, assign a title to the template like “Product announcement” or “Weekly blog” to indicate when a member of your team could best utilize this post template. Social campaigns usually consist of an extensive collection of outgoing promotional posts, visual assets and an engagement strategy to maximize impact. 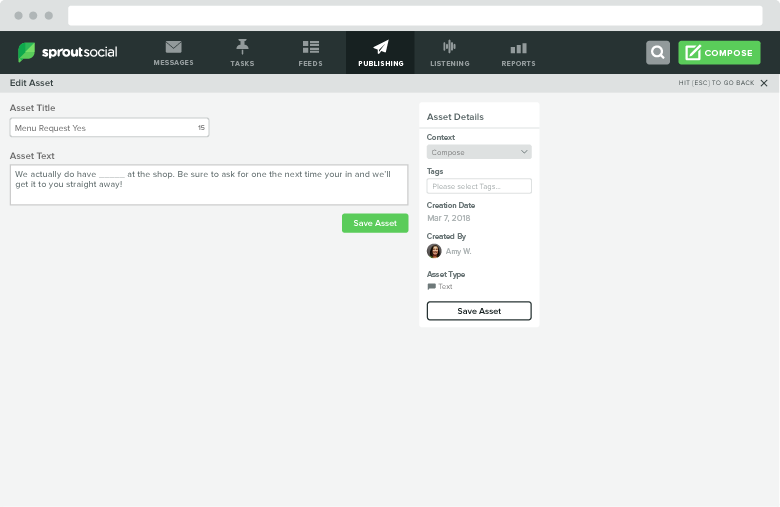 Sprout’s enhanced Asset Library enables your team to plan and organize (with tags). Additionally, they can also build a library of official responses to common inquiries and links to campaign details. By assigning the proper Asset Context to each text asset and applying the appropriate campaign tags, you or your team can quickly find the assets they need within their specific role. Use Sprout’s Asset Library to promote efficient and effective campaign planning and management by creating and collecting Saved Replies for use within the Smart Inbox, Publishing tab or both. Sprout wants to hear from you! How do you plan on using the updated Asset Library in your social strategy?